October 1 1938 Commemorative single medal bar. Excellent condition. You don't see these mounted very often. 1 Oktober 1938 minnesmedalj paradmonterad. Utmärkt skick. Du ser inte dessa paradmonterade så ofta. The Sudetenland Medal has a history dating back to just before World War II. On 1 October 1938, German forces entered the Sudetenland and annexed the area to the Third Reich. To commemorate this event, on 18 Oct. 1938 the Nazis issued a special medal to be given to the German military forces who took part in the occupation. 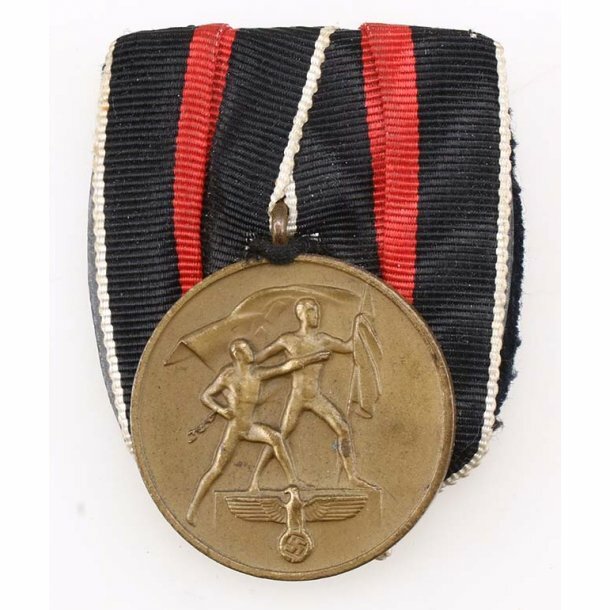 The medal was also given to the soldiers who took part in the occupation of Czechoslovakia in March 1939. The soldiers who took part in both occupations received the Prague Castle bar, which was worn on the ribbon of the medal.